There can never be enough BBQ. Have I said that enough yet? It seems like there are two pretty distinct styles of BBQ here in Kalamazoo. 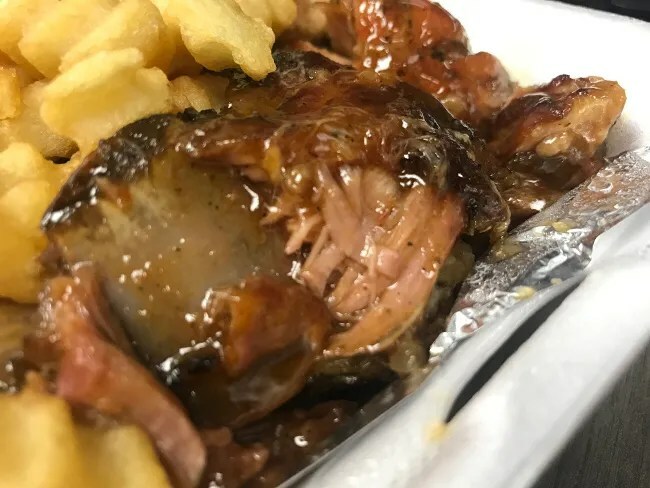 There’s the big commercial stuff that always has brisket, pulled pork, and baby back ribs…then there’s the more neighborhood stuff with the spare ribs, rib tips, and BBQ chicken. Both of them have things that I really enjoy and if I can find a place with good rib tips, my shirts better get ready to be stained with BBQ sauce. As I was looking through planning commission meeting minutes as one does, I came across something interesting. 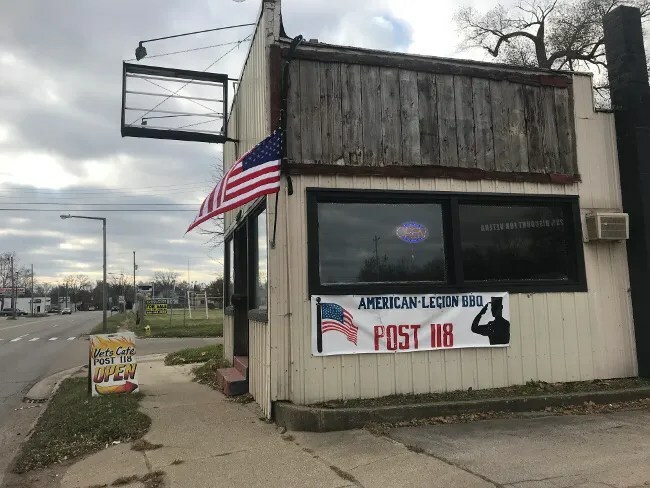 A cafe was being planned by what was to become an American Legion post. There wasn’t much info then. They were trying to get a liquor license if I remember right but it’s something I kept looking for over the summer. I don’t get down Riverview Drive very often but a few months ago, I was heading out towards Richland and I noticed a new sign on an old building. 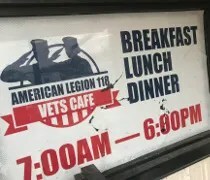 The American Legion 118 Vet’s Cafe was open. The Vet’s Cafe is in a building on the corner of Riverview and Hotop Avenue. It has been so many things over the years. The most recent was Jaddin’s Precious Soul Food Cafe. Before that, it was a couple of different short lived soul food places and Beale Street BBQ. This corner has a history of this kind of BBQ but it also has a history of businesses not lasting very long. Not a lot of has changed since the last time I was in the building three years ago. The parking lot is along the north side and you have to dodge some pretty big potholes (although there was a guy out there trying to fill them in the day I stopped by.). When you walk in the door, there is an order counter and a couple of tables in the first room you encounter. The entrance to the building is actually on the north side off the parking not….not the front where the sidewalk is along Riverview. The dining room is simple. There’s a row of booths and a row a tables in the long narrow room. I was told I just missed the breakfast rush and the place was packed about a half hour before I got there. I was kind of in that in between time after breakfast but not quite lunch so there was only one other person waiting for a to-go order when I came in. The menu is simple with soul food staples and the rib tips I was hoping they would have. I did an order of a half pound of tips and fries which also came with a roll and a can of pop for just a little under $10 before tip. It took about ten minutes before I was handed a bag with food. 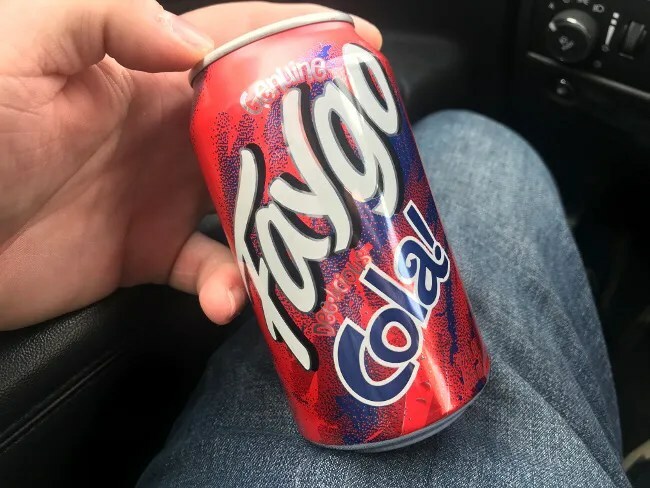 I chose a Faygo Cola as my drink then headed back to work to eat. 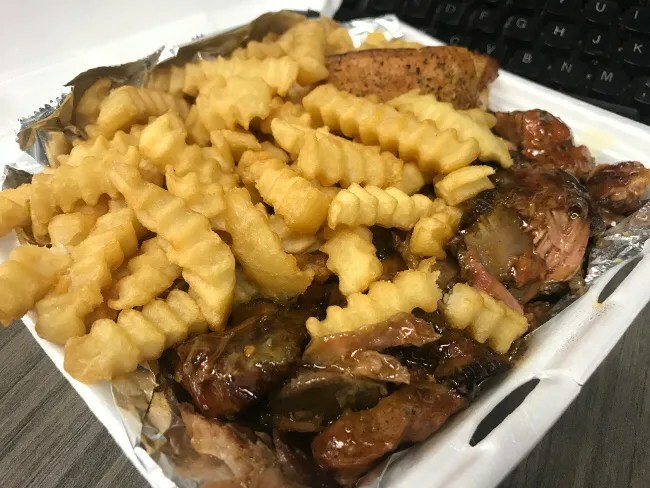 I started in on the fries when I got back to the office because there were so many of them, they pretty much covered up the tips. The fries were simple frozen crinkle cut fries. I tried to soak up some of the sauce with the fries but it wasn’t a thick, sweet sauce so it didn’t work all that well. I was still happy with the quantity even if the fries themselves were nothing all that special. The rib tips were a little different than what I am used to but man they were tender. It took no effort at all for them to just slide off the bone. The thing that made these different were the sauce. In Grand Rapids, I seemed to always get a real thick, sweet sauce. That is not the case at Vet’s Cafe. The sauce is much thinner and more vinegar-y. It’s very reminiscent to a Carolina sauce…but just a little thicker. 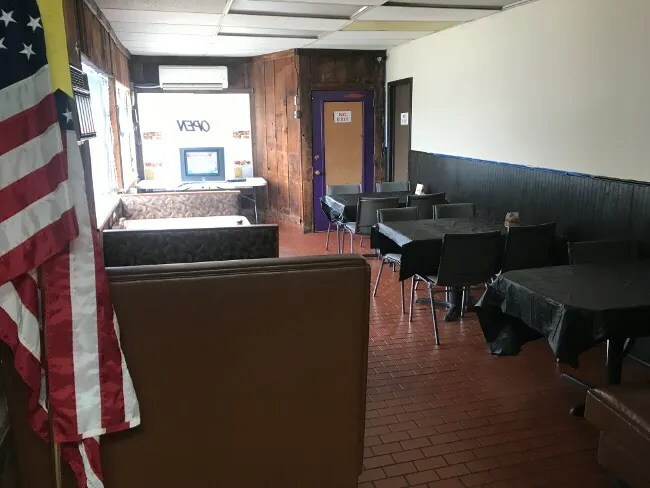 American Legion 118 Vet’s Cafe does a lot of the Soul Food things that have already been done at this location. Jaddin’s Precious lasted a couple years in this spot and I always had a good meal when I stopped in. 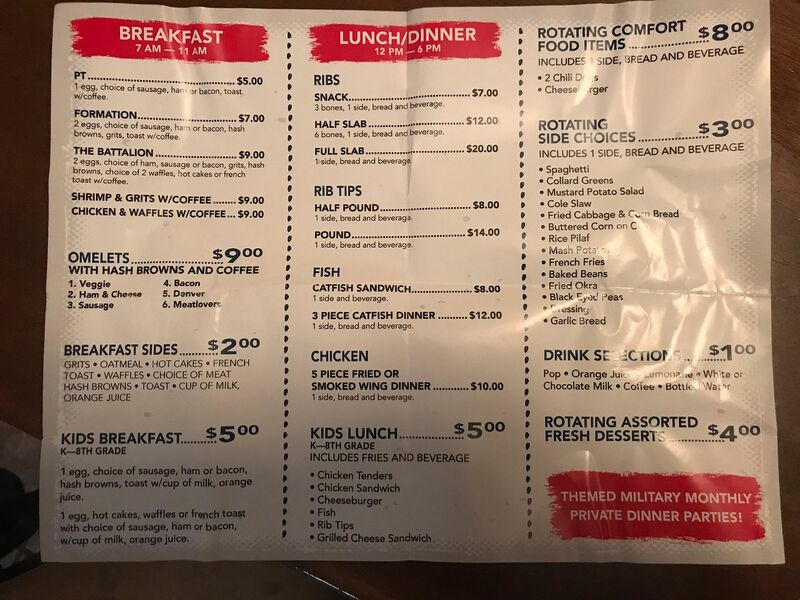 I hope Vet’s Cafe can be successful here as well. 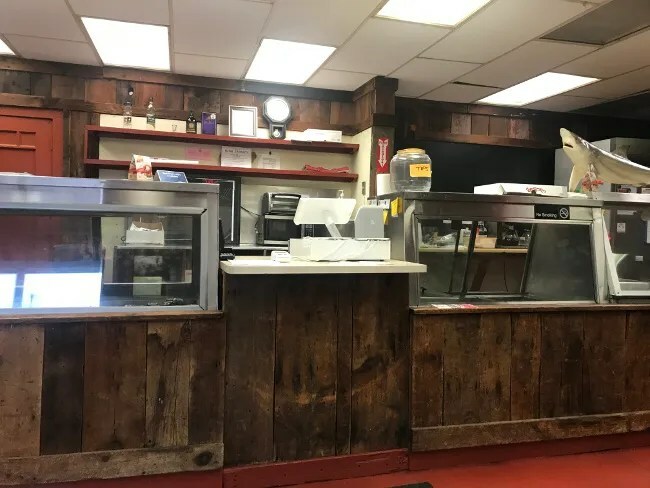 Kalamazoo doesn’t have a lot of places like this where you can get delicious, slow smoked meats along the traditional soul food sides for a price like you do here. The sauce wasn’t quite what I was expecting but I can’t really convey to you just how tender these tips were.